As the Mid-Atlantic prepares for a blizzard with up to two feet of snow possible, we’ve compiled the top five storms at Washington D.C., as recorded since 1885. For information on the current storm visit the National Weather Service. The weight of the snow collapsed the roof of the Knickerbocker Theatre, killing 98 people and injuring 130. There was drifting snow and blocked roads. Railroad and electric car services ceased and businesses were closed. Snow drifted 10-20 feet deep, mail delivery stopped and country roads were entirely blocked. Street car and railroad traffic was suspended creating food and coal shortages that resulted in rationing. 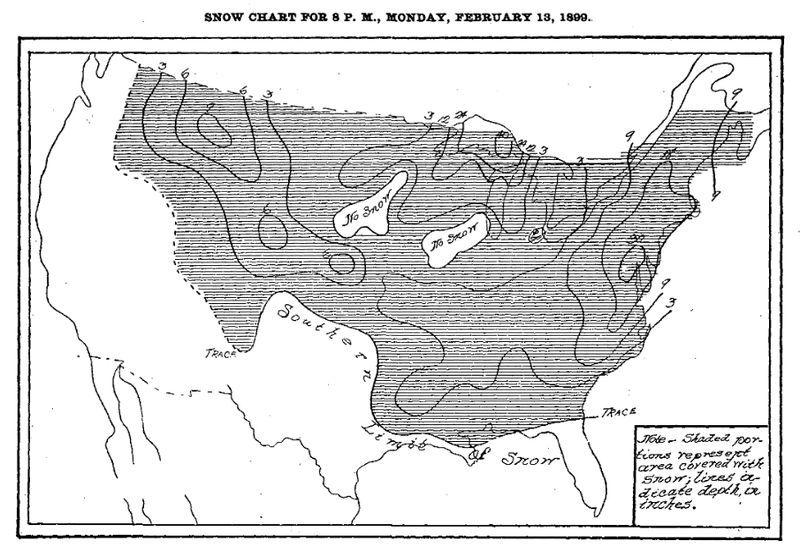 From the Climate and Crop Service Report for February 1899. 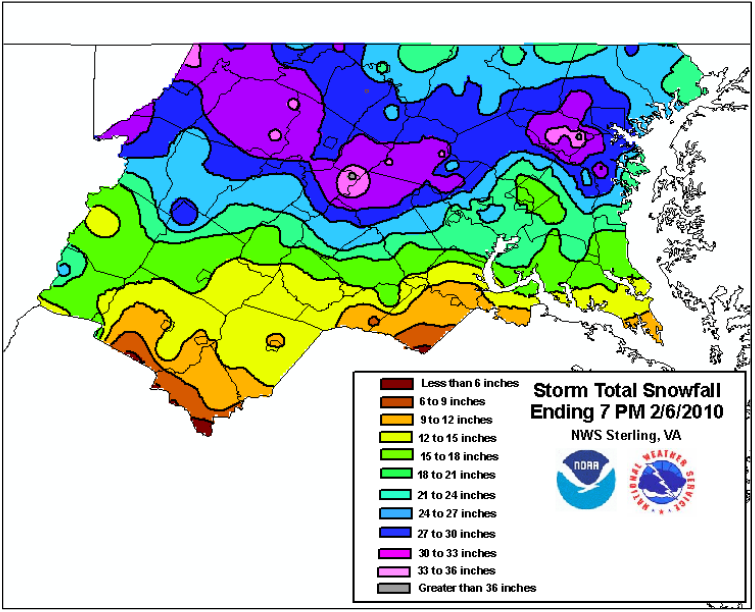 Snowfall rates of 3-4" per hour were noted. Travel was halted for two days. There were fatalities due to heart attacks from shoveling, exposure, auto-related, and a fire victim because rescue equipment was slowed by road conditions. Transportation was impacted and there were power outages due to the heavy snow. Schools, businesses and governments were closed for several days. Dulles Airport reported 32.4". This became known as "Blizzard One", as a second blizzard would hit the area later the same month. Gusts up to 35 mph caused snow drifts of 5 feet. All major highways were closed through the 7th and residential areas remained unplowed for up to a week. The Washington subway system was shut down and all public schools, as well as federal, state, and local governments, were closed for two days. This was on the heals of the government shut down, hence the name. 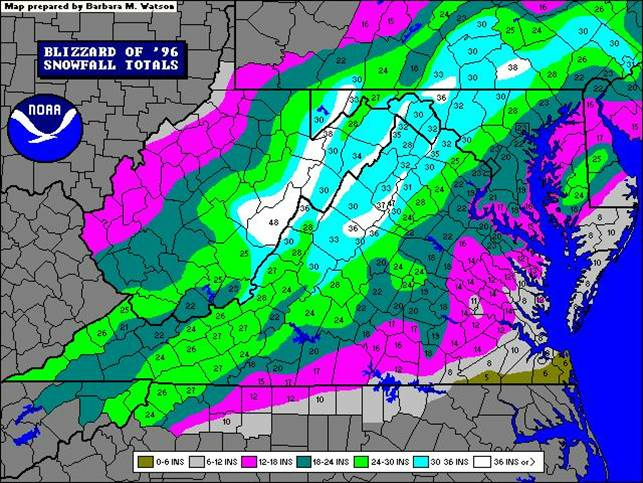 This snowfall contributed to the flood of 1996.